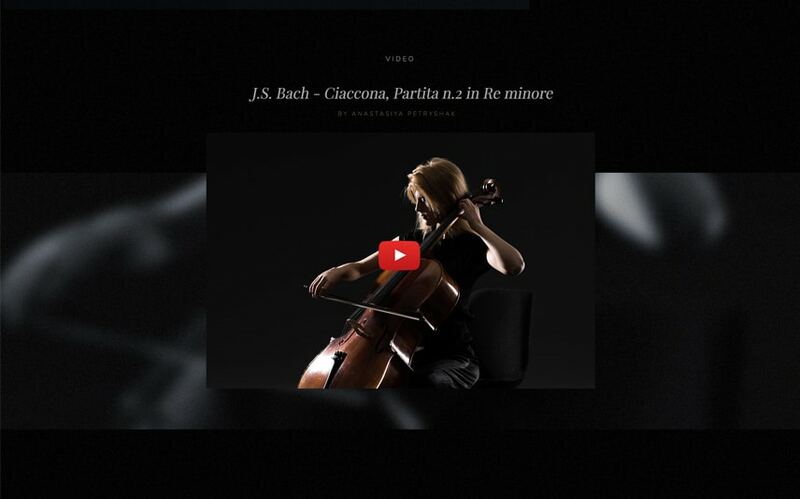 This Classical Music WordPress theme will make you shine on every aspect. 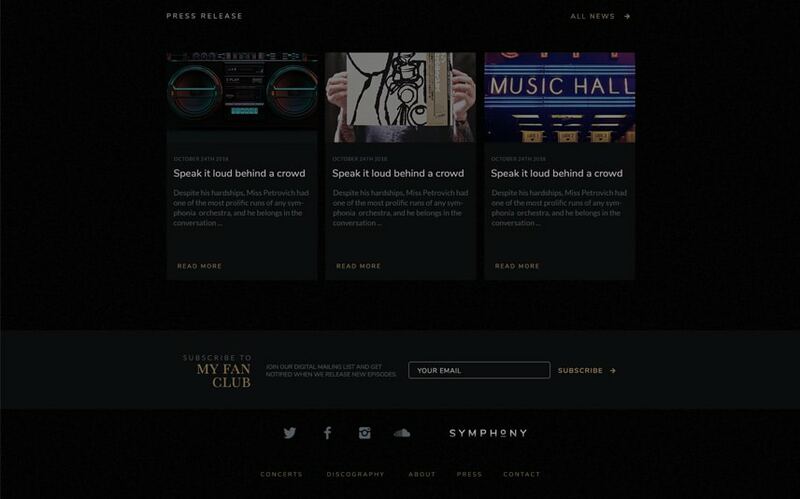 Symphony WordPress Theme is a beautiful handcrafted template for any concerto musicians playing in orchestra or for any soloist performers. The design is dark but modern and use a mixture of big and small font headings to give your website a slick design architecture layout. An audio player is displayed on the first fold of your homepage so your audience can spot and listen to your music as they enter the website. The music player which comes with this classical music WordPress theme is one of the best looking audio player every designed! You can also move your music player anywhere on your page by drag-and-drop the widget anywhere you’d like. Watch the slick spectrum analyzer’s waves move to the beat of your music. It’s wonderful and perfectly fits with any orchestra, opera or classical music. In addition, this AJAX audio player has a continuous playback option that allows your listeners to browse your website without the music stops when they load a new web page. This Classical WordPress Music Theme has everything it takes to bring your music website to a next level. Check out all the feature of the Continuous AJAX player. Symphony WordPress Theme is a very flexible template for any musicians. 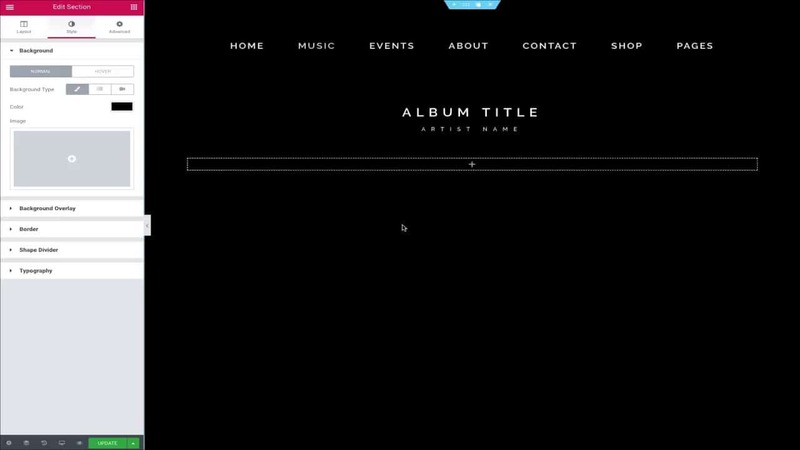 By using the visual page builder, you can choose any of the 30 modules available specifically designed for music websites and arrange these widgets in the order you want. You can change the colours, typographies, sizing, margin and padding of every add-ons to make very personalized layouts. Absolutely no code or programming skills is required. When you install Symphony WordPress Theme for the first time, you will import the demo content. Your website will look exactly to the demo. Then you will be using a visual page builder called Elementor Page Builder. It will allow you too add new blocks, or modify or remove the existing blocks in the layout you have previously imported. It’s the best music WordPress theme available for beginners. If you are an advanced user, you will be surprised by how far you can go with this classical music WordPress theme. In fact, all the Sonaar WordPress theme demos you’ll find on this marketplace has been built with a singular master theme called Sonaar. If you are an instrumental musician, chances are that you produce music and have some recording to sell. 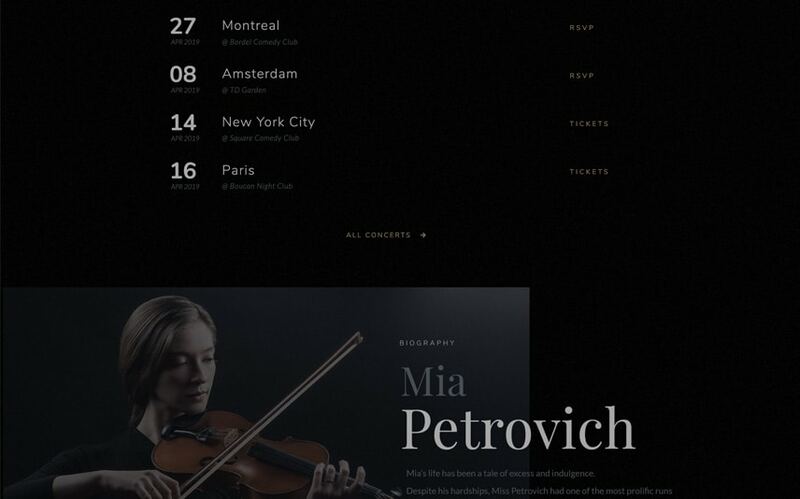 This Classical Music WordPress theme allows you to sell your discography or EPs directly on your website by using the WooCommerce free plugin. More info on WooCommerce. 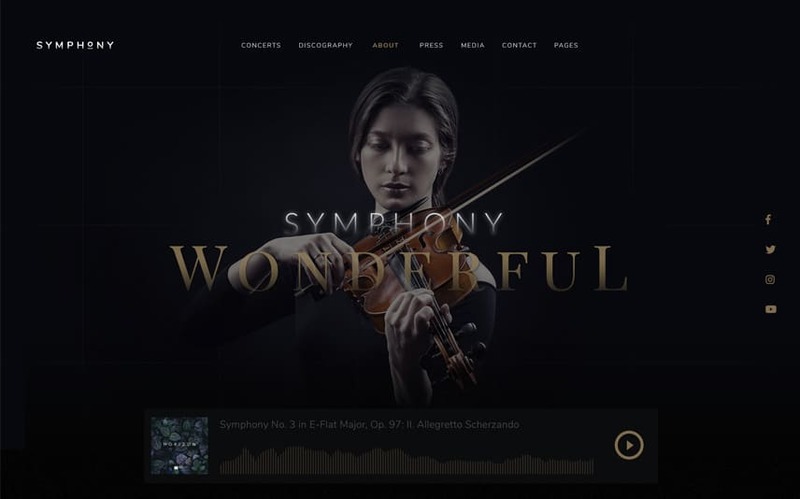 If you are an instrumental artist and are looking to create a next-generation website, Symphony WordPress theme shall be at the top of your list. 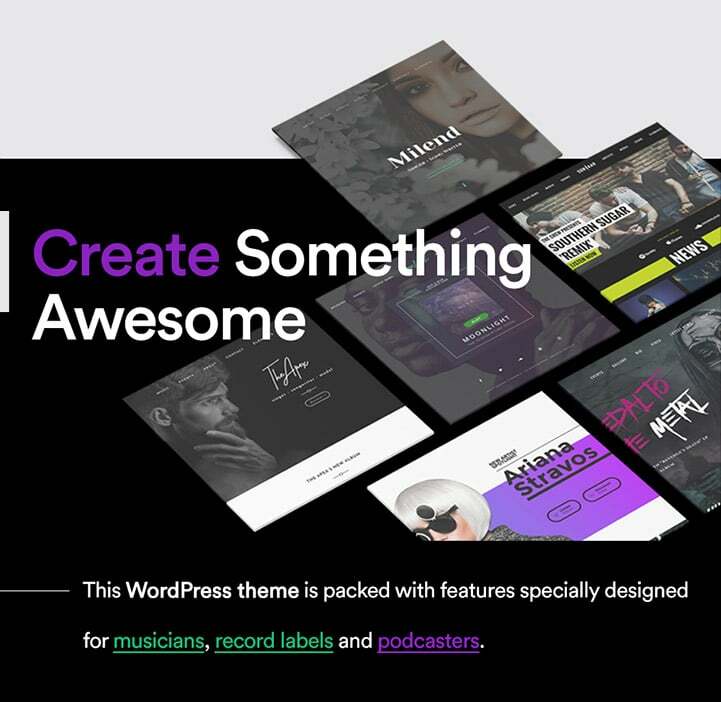 It has so many theme features that it’s gonna be the last musical WordPress theme you will buy. Discography: You can add unlimited albums, playlists and music tracks. You can also stream your music from different platforms. Concert Manager: The theme contains a concert and events custom post types to display your upcoming events and past concerts. Biography: The template has a text block feature to add your short biography as well as your whole musician story. Photo Gallery: This WP theme contains a photo and media gallery with lightbox and popups. Video Gallery: You can embed any YouTube, Vimeo or self-hosted HTML5 videos. You can also display your YouTube channel directly on your page. Press Release: This theme contains a solid blog platform where you can add news, blog posts, and press releases. Contact and Booking Form: This theme is compatible with Contact Form 7 plugin which allows you to create any booking forms and send you an email when people fill the forms. Unlimited Menu Items: You can add, rename and remove any menu items. Go to Appearance > Menu and manage the menu of your website from there. Visual Page Builder: Our theme is fully compatible with Elementor Page Builder (free version) as well as the Elementor Pro (extra add-on). It allows you to create unlimited styles of layouts. Mobile Friendly: This theme is 100% mobile friendly, Your website will perfectly fit on mobile, tablets and desktops computers. Translate in any language: You can translate all the stings and texts by using WeGlot.com or any multilingual plugins. 1 to 12 column layouts: You can display any widgets to spread 1 columns to 12 columns. Video Background: This theme supports full width video backgrounds. The video source can be YouTube, Vimeo or HTML5 video hosted locally. Full-width and boxed content: You can decide to use a full-width or boxed content for each page. This can be set in the general settings or independently on individual pages. SEO Optimized: The theme fully support Yoast SEO plugin to boost your website’s SEO. New features are added regularly and this theme is extremely well maintained. It works with the latest version of WordPress and is compatible with most of the popular WordPress plugins. If you run into any issues or need help with your website, our dedicated support team will assist you for free (and fast!) with any active subscription.